A campaign has been launched by Network Rail to try and reduce the number of lorries crashing into rail bridges, with each incident costing taxpayers in the UK £13,500 to put right. According to Network Rail, drivers of oversized lorries who aren’t fully aware of the dimensions of their vehicle are responsible for around 2,000 bridge crashes every year. As a result, commuters in the UK can expect hours of delays following such an incident, whilst individual bridge strikes on average cause trains to be delayed by two hours. The annual bill taxpayers are picking up because of damage and delays caused by ‘bridge bashing’ is around £23million, with each individual crash costing around £13,500 to fix. Every year in the UK around 2,000 lorries crash into rail bridges © Copyright Nigel Mykura and licensed for reuse under this Creative Commons Licence. A number of bridges in the UK are hit once a month or even more and one in Ely, Cambridgeshire, has been struck 113 times over the last eight years, whilst a bridge in Tulse Hill, south London, has been bashed into 92 times within the same period. According to research, 43% of lorry drivers have no idea what the size of their vehicle is, whilst 52% said they never considered low bridges when planning their next journey. In the UK, around five bridges are struck by lorries every day, so Network Rail are launching a ‘what the truck’ campaign to try and reduce the number of ‘bridge bashing’ incidents. As part of their programme, steel beams would be fitted to rail bridges to reduce the amount of damage inflicted on them when hit by a lorry and signage showing the height of the bridge would be improved. 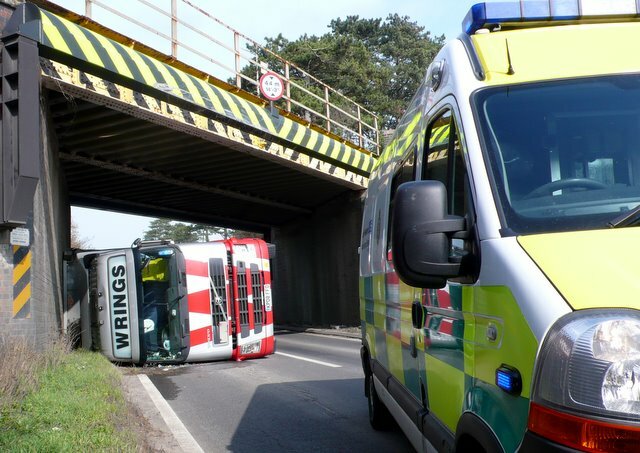 Any lorry driver striking a bridge should also face much tougher penalties. “Every incident creates potential delay for tens of thousands of passengers and potential costs for taxpayers, and this is happening multiple times a day… we need professional HGV drivers and their operator employers to get behind and support this campaign,” said Sir Peter Hendy, chairman of Network Rail.